You can listen to a recent podcast conversation I had with Marko Kulik about developing your unique photography style at Photography.ca or on iTunes. Pho­tog­ra­phy pod­cast #134 fea­tures an inter­view with Toronto, Ontario fine art pho­tog­rapher Bret Culp. Dur­ing the inter­view we talk about find­ing and devel­op­ing your own pho­tog­ra­phy or shoot­ing style. Bret offers up some prac­ti­cal tips on how to make this process easier. 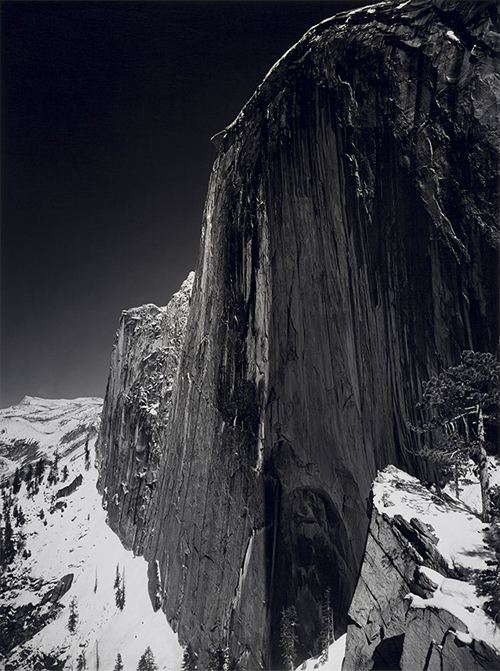 In the podcast I discuss that the iconic photograph Mono­lith, The face of Half Dome, made by Ansel Adams in 1927, is a great example of an artist choosing a specific technique as a way of expressing how he felt about a subject, as opposed to trying to capture exactly how it appeared before him. Apparently Ansel was unhappy with his earlier photographs of this subject citing that they lacked the power he felt when in its midst. In a moment of inspiration he decided to place a deep red filter in front of his lens resulting in a heavily darkened sky and increased contrast, releasing the drama of the scene that he felt when looking at it. To my knowledge, this photograph was the first time he used such techniques, and for which he became famous.